Nuts-n-Bolts: The decision to not pursue Torii Hunter down the free agent rabbit hole was a wise choice by Smith considering how stratospheric his market value increased in his walk year. At 31 years old, Hunter had his second best season offensively (OPS+ 122) making him and his historically solid defense a desired commodity. The day before Thanksgiving Arturo Moreno, owner of the Los Angeles Angels, signed Hunter to a five-year, $90 million dollar contract. Because of his accelerated age, Hunter projects to decline over the course of the next few seasons (both Bill James and Marcels projections assume that he will have a drop in OBP and lose some power in 2009). What's more is that even the defense that had made him so valuable is inevitably going to drop to levels that will force him to a corner outfield or designated hitter role, therefore by year four or even possibly year three of his contract Hunter will be supplying less than league average production at a substantial cost to the Angels. Grade: B. Letting Hunter walk was the only option. His contractual demands far exceed his projected contributions (year one looks decent in retrospect but the subsquent years will not look as favorable). Since Hunter was labeled a Type A free agent the Twins were granted two compensatory draft picks. With these, the team selected college pitchers Carlos Gutierrez and Shooter Hunt. Gutierrez, a University of Miami alum, is already a survivor of Tommy John surgery so the Twins will probably use the kid's gloves with his development. He spent 2008 in A+ Fort Myers where he worked from out of the bullpen, working 25 innings with a 2.71 K/BB. 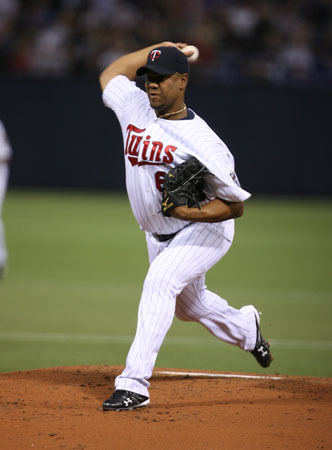 A three-pitch pitchers, the Twins are going to use Gutierrez as a starter in 2009. Hunt, a Tulane University alum, was initially sent to Elizabethton (rk) where he dominated much younger competition. A shift to the more age appropriate Midwest League brought Hunt's numbers to reality. While with Beloit, Hunt threw 31 innings as a starter and saw his control dissipate as he issued 27 walks. The only question is whether the two compensation picks pan out. Nuts-n-Bolts: Carlos Silva is as utilitarian of a pitcher as they come by. In his Twins career, he posted a 47-45 record and flirted with 200 innings each of the four seasons in Minnesota. He didn't walk anybody nor did he strikeout that many either. This power sinker pitcher threw to contact and blossomed from the usually solid defense placed behind him and when he doesn't have it, his numbers suffer. His year with his highest ERA, 5.94, was the same year Tony Batista and Juan Castro roamed the left side of the infield. As his contract was about to expire after the 2007 season, Bill Smith stood pat as Silva was valued as one of the top free agent pitchers on the market. To his agent's credit, Silva was able to milk four-years, $48 million out of Seattle while the Twins waved bu-bye. Grade: A. Silva's first season in Seattle was disastrous. The Chief went 4-15 with a 6.46 ERA in 28 starts but is better than those numbers show considering behind him was a defense with the second lowest DER in the American League (.679). Silva will most likely rebound in 2009 to produce decent numbers but no resigning him saved the Twins $48 million for labor that was available internally. The Twins slotted Nick Blackburn into Silva's former spot in the rotation and was a very similar pitcher to Silva in that he threw to contact and was stingy with the walks. Blackburn, however, gave the Twins 5 WSAB while finishing 11-11 with a league-average ERA of 4.05 thanks to a sturdy defense (.688 DER). Nuts-n-Bolts: Recognizing the fact that a) Torii Hunter was not going to be with the team in 2008 and b) the team posted low numbers against left-handed pitching in 2007, Smith went to work attempting to find an inexpensive right-handed replacement. The search ended with the Twins trading a Player To Be Named Later to the Cubs for Craig Monroe in November and on December 11th, the Twins signed Monroe to a one-year, $3.82 million contract with performance bonuses totaling $180,000. The expectation was that Monroe would give the Twins a potent bat against lefties as a designated hitter and fourth outfielder. Monroe - who showed a moderate level of success against lefties split between the Tigers and the Cubs in 2007 hitting .271/.309/.496 in 140 plate appearances - had a fairly average career track record against lefties. Grade: C. Assuming that at 31 years old Monroe was going to provide production at levels he never was capable of achieving in the first place was foolish but the drop off in production was amazing. He finished 2008 hitting only .138/.219/.230 in 96 plate appearances against the wrong-handers. Admittedly, Monroe slugged six home runs in just 76 at-bats (a HR every 7.8 at bats) and slugged .605 but, for the most part, stole at-bats and playing time from Jason Kubel. Nuts-n-Bolts: The Twins were looking to deal for a right-handed power bat that could supplant Torii Hunter in the lineup. The Rays were looking for young pitching and a legitimate shortstop to shore up the infield. With an initial deal of Matt Garza, Jason Bartlett and Juan Rincon the Rays were almost ready to part with Delmon Young, Brendan Harris and Jason Pridie - but it took the inclusion of Eduardo Morlan (a recent Brewers Rule 5 selection) to complete this deal. Grade: B-. Yes, the trade may have ultimately cost the Twins the 2008 AL Central as they seemed to be one starting pitcher short, but Young has too much potential and some years to hone in on his plate approach to dismiss this as a lop-sided trade. Yes, the Rays are the short-term victor but Smith probably positioned his team well to benefit from this exchange in years to come. Nuts-n-Bolts: Losing their starting shortstop without any obvious internal candidates on hand, Smith turned to the open market. Available were low-grade options in Cesar Izturis, Neifi Perez and Jerry Hairston as well as diminutive shortstops in Adam Everett and David Eckstein. Valuing defense, the Twins targeted Everett, who was the highest rated shortstop according to the Fielding Bible +/- as recently as 2006, and signed him to a one-year, $2.4 million contract. Grade: C. With a .248/.299/.357 career batting line, the Twins held no pretensions that they were acquiring an offense-oriented shortstop. Various ailments, however, kept Everett out of the lineup and limited to 48 games all year. In hindsight, the Cardinals signed Cesar Izturis for $50,000 more than Everett and he played in 135 games and was the fourth-best defensive shortstop (+14) and hit .263/.319/.309. Nuts-n-Bolts: Like every offseason since losing Corey Koskie, the Twins were in the market for a third baseman. In 2007, the combination of third basemen at the Metrodome hit a collective .236/.308/.323. The Twins had an apparent interest in Lamb for years, drafting him in 1996, and finally signed the 31 year old to a two-year, $6.6 million hoping he could recreate his 2007's .289/.366/.453 batting line. Grade: D. It is not just the lowly .231/.268/.312 batting line that was even worse than the output of the Twins third baseman in 2007, but rather it was the massive failure by the scouting department that overvalued Lamb and extended him the nearly $7 million dollar contract. Admittedly it would be hard to predict a collapse of this magnitude, nevertheless, the Twins are still obligated to pay $2.6 in 2009 to Lamb. Nuts-n-Bolts: After going 93-44 with a 3.22 ERA, 1,381 strikeouts, only one stint on the disabled list and two Cy Youngs adorning his mantle, it was evident that Johan Santana was due for a raise at the expiration of his current contract following the 2008 season. The problem was was that Santana was expecting Barry Zito-type money (seven-years, $126 million). When the Venezuelan spurned Smith's offering of four-years, $80 million, Smith began shopping him around to the teams that have that kind of money to burn - the New Yorks, Los Angeles and Boston. The Red Sox and the Yankees showed interest but in the end their offers were more like calculated stalemate propositions of a Cold War, pushing it to the brink but hoping the other would back down as well. Only the Mets presented a package that contained the prospects that could satisfy the Twins: A replacement for Hunter and three potentially useful pitchers. The Mets then inked Santana to a record-setting contract of $137.5 million over six years, besting Zito's average annual value of $18 million by $4.9 million per season. Grade: B-. The group acquired in return for Santana is good. Gomez had a muddling year at the plate (.258/.296/.360) but excelled in the field (+32 center fielder, best in baseball). Humber should contribute in 2009 in the bullpen. Mulvey is interesting in that he threw 148 innings at AAA and posted a very good 121/48 K/BB ratio with a 3.77 ERA (well below the league average of 4.10). The 19 year old Guerra's performance is concerning - in 130 innings at A+, he struck out 71 and also walked 71, posting an ERA of 5.47. This is a solid bounty. What drops this grade is the possibility of what 2008 would have been like had Santana played out his contract with the Twins. Nuts-n-Bolts: The Twins had lost three members of the starting rotation following the Santana trade leaving the five-man without any real established pitchers. With Francisco Liriano not necessarily ready at Opening Day and unproven starters in Baker, Bonser, Blackburn, Slowey and Perkins, the Twins went fishing in the veteran well. Hernandez, 33, while with the Diamondbacks in 2007 finished the year with an 11-11 and a 4.03 ERA and devoured over 200 innings. Bill Smith signed him to a $5 million, one-year contract (with $2 million in incentives) to front the 2008 rotation. Grade: C-. At the time of the signing, I wrote "200+ innings is great, only if they are not laden with runs surrendered. As Hernandez’s 2007 home run total (34, 2nd in the NL), earned runs (114, 4th) and hits allowed (247, 1st) would suggest, he is a potential liability in the designated hitter American League." At the conclusion of the 2008 season, Hernandez led all of baseball in hits allowed (257, 1st) and earned runs (121, 1st). And he didn't even get to 200 innings. Nuts-n-Bolts: With a weak bullpen due to Pat Neshek's season ending injury, the Twins were desperate for, well, relief. Breslow had been given just 8.3 innings with the Cleveland Indians in 2008 while allowing three runs. The lefty had posted very good minor league numbers, throwing 357 innings over six season and striking out 383, so the Twins took a minimal risk in claiming Breslow off of the waivers. Grade: A-. Breslow quickly became a integral component in the bullpen, pitching 38.2 innings and posting a 1.83 ERA. Left-handed opponents hit just .183/.230/.232 in 88 plate appearances, helping alleviate the necessity to overuse Dennys Reyes. In the month of September, Breslow was awesome, throwing nine innings and allowed just one inherited run to score out of 15. This claim reaffirms the fact that the Twins staff is very knowledgeable when it comes to other team's organizational talent. Nuts-n-Bolts: When the trade deadline past in July without any transactions for relief support and a bullpen that held a 5.21 ERA for the month, the Twins seemed to paint themselves into a corner. Chad Bradford and Latroy Hawkins slipped through their fingers but the 37 year old Eddie Guardado was having a surprisingly good season for the Rangers. Texas was 63-68, looking upwards of 17 games to the division leading Angels, and acted like any bankrupt company trying to liquidate any non-useful parts and Eddie Guardado qualified as such. Guardado had increased in value by throwing in over 55 games in relief, posting a 3.65 ERA and limiting opponents to a .220/.286/.358 batting line. The Twins, familiar with Everyday Eddie, sent a 21 year old pitcher, Mark Hamburger, who had thrown 36.2 innings in the Appalachian League while striking out 40 and walking just 13. Grade: D-. Guardado provided the Twins with seven lackluster innings, allowing six runs and an opponent batting line of .387/.424/.581 in that span. The grade is based on the fact that several other viable options were overlooked (Bradford, Hawkins, Mijares) before settling on Guardado. In the grand scheme of things, the move was a minimal risk as Hamburger will not result in John Smoltz down the road. Overall Grade: C+. Smith continued what has been protocol set by Terry Ryan. Once again, Smith and his team signed free agents that didn't perform, including Hernandez, Everett and Lamb. Add those names to the long list created by Ryan. The front office has been great at developing internal talent and harvesting talent from other teams but they can never seem to hit on the free agents that produce. The latter two ideas will ensure that the Twins remain a competitive ballclub. It is the former, signing one or two free agents that contribute immensely, that helps procure championships.